The Drawing Room, Oscarshalls second largest room, looks out on to the park through two large east-facing glass doors and three high Gothic arch windows on the north wall. The windows and the doors are both topped with stained glass features of Neo-Gothic design. Nebelongs original designs for Oscarshall featured small paned windows, but King Oscar I favoured large panes as these would make the room brighter. This heightened the sensation of being in a garden room, as close to nature as possible, which was in keeping with the ideals of romantic architecture. Both the furniture and the ornamentation emphasise the medieval atmosphere in the Drawing Room, and evoke the style of the old Norwegian guildhall. The dados and the tracery were carved in oak by master carpenter Abrahamsen . The wall panels are covered with red velvet. In the middle of the main ceiling panel there is a diamond shape with blue and red decoration surrounding a gilded plaster rose, from which a chandelier is suspended. The whole feature is reminiscent of a gothic rose window. Around this central panel there are four smaller panels each with a different coat of arms. These depict the national coats of arms of Norway and Sweden, the family coat of arms of King Oscar and Queen Joséphine, the Bernadotte coat of arms and the Leuchtenberg coat of arms from Bavaria. Further coats of arms are to be found above the doors. The use of coats of arms in royal interiors was not unusual for the period, but the decorative use of heraldry at Oscarshall can also be seen as an important aspect of the Neo-Gothic style. The Middle Ages were the heyday of heraldry, and Neo-Gothic aficionados often took a keen interest in history, genealogy and family trees. 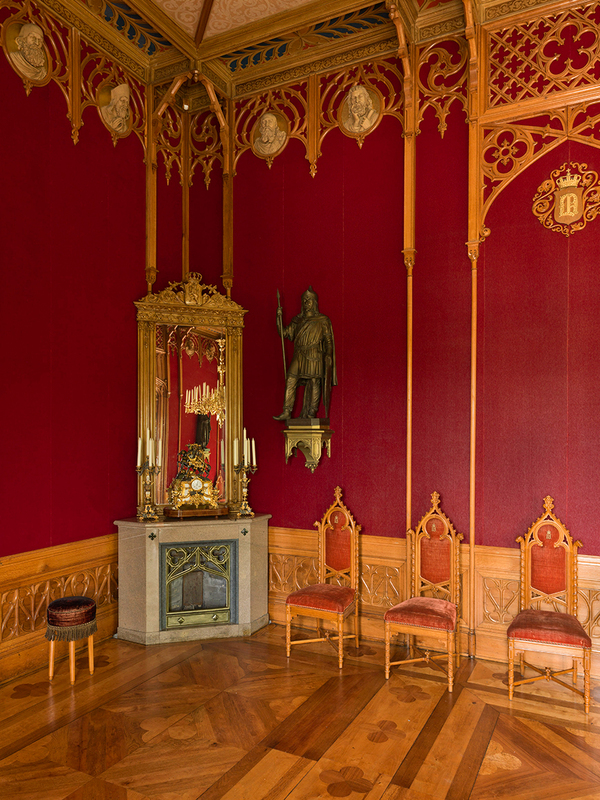 The artistic ornamentation by Hans Michelsen and Christopher Borch enhances the medieval character of the room. King Oscar I took an active part in choosing the artists and the motifs of the sculptures. He particularly wanted Hans Michelsen to be involved in the project. Michelsen sculpted four statues of Norwegian medieval kings that are placed on plinths in the main panels of the end walls in the Drawing Room. On the west wall are King Harald Fairhair and King Olav the Holy. On the east wall are King Sverre Sigurdsson and King Olav Tryggvason. Christopher Borch modelled the 20 heads that appear in circular panels as part of the wall decoration. There are five different types of head, each of which is repeated four times. They represent medieval figures: the warrior, the peasant, the clergyman, the statesman and the scribe. Borch was a young Norwegian sculptor who had had his first exhibition in the Christiania Kunstforening (art association) in 1848 and this commission from King Oscar I was intended to boost his career. While Michelsens career was nearing its end, Borch was just embarking on his. Borch is perhaps best known for the two large granite lions in front of the Storting, which were carved by stone mason apprentices among the inmates at Akershus fortress using Borchs models. 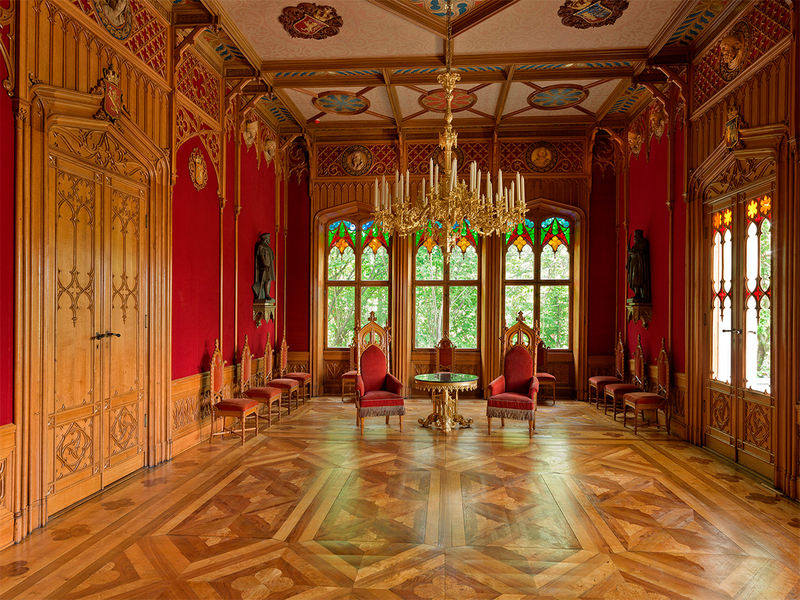 The items of furniture designed by Nebelong for the Oscarshall Summer Palace are some of the best examples of Neo-Gothic art in Norway. The chairs in particular have been considered some of Nebelongs most successful designs. Along the walls of the Drawing Room there are 18 high-backed Neo-Gothic chairs, upholstered in the same red velvet as the walls and featuring the monogram of King Oscar I embroidered in the back. Two armchairs, said to be used by King Oscar I and Queen Joséphine when they received guests, stand on the floor of the room on each side of a gilded, marble-topped round table. Utsnitt fra salongen på Oscarshall. Foto: Jan Haug, Det kongelige hoff.